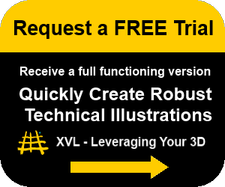 Technical illustrations can be produced quickly and easily using XVL Technical Illustration Suite. It is a complete solution to help you lower the cost and time required to create and publish technical illustrations and images using existing 3D CAD data. Use the powerful tools included with the suite to create high quality technical illustrations for parts catalogs, service manuals, marketing & sales and other documents, in a simple and efficient manner. Drag and drop your existing 3D CAD models into the XVL Illustration Suite to create exploded views with trace lines, call outs, notes and dimensions and then publish as vector illustrations or raster images. You can even create your own service BOM and link to the parts interactively. Additionally, you can easily create your own sBOM’s and mBOM’s interactively or import information from ERP, MES or other systems. Open CAD and neutral format files directly • CATIA V5, CATIA V4, Pro/ENGINEER, NX, SolidWorks, Autodesk Inventor, JT, STEP, IGES and more. See www.lattice3d.com for the latest supported formats. Publish Raster Graphics (JPEG,PNG,TIFF, BMP), Vector Line Art (SVG, CGM, EPS, DXF), 3D interactive models (view with Free XVL Player).